By Chris Williams: WBC light heavyweight champion Adonis ‘Superman’ Stevenson (29-1-1, 24 KOs) says he’ll give former 2-division world champion Badou Jack (22-1-3, 13 KOs) a rematch after fighting to a 12 round majority draw against him last Saturday night at the Air Canada Centre in Toronto, Canada. Stevenson vs. Jack was a back and forth fight in the last 6 rounds last night with both guys taking turns dishing out heavy punishment. Stevenson was badly hurt in the final 15 seconds of the bout after Jack connected with two hard uppercuts. Somehow, Stevenson was able to stay on his feet as Jack hit him with repeated head shots in the last moments of the bout. The judges scored it 114-114, 114-114 and 115-113 for Jack. Stevenson looked like he had edged it though. Stevenson appeared to win more rounds. Stevenson was the better fighter in 8 of the 12 rounds, so he should have been given the victory last night. It’s hard to make an argument that Jack deserved to win rounds 1, 2, 3, 4, 5, 6, 10 or 11. Those were all rounds in which Stevenson was hammering Jack with heavy blows. Jack had a lot of boxing fans excited the way he was able to creep back into the fight beginning in the 7th, because he looked like he was over-matched in the first six rounds of the fight. The main reason why Jack, 34, was getting beaten in rounds 1 through 6 is because he wasn’t willing to stand and fight Stevenson. Jack gave Stevenson too much respect by moving constantly, and not squaring off to battle him. If you want to beat the champion, you’ve got to come to fight, and Jack didn’t do that in the first 6 rounds. He forfeited those rounds by doing little besides running. “Definitely, I won the fight, because I hurt him on the body and he slowed down and I was kind of pressing him,” Stevenson said after the fight. ”He was moving slick, but I touched him most of the time. I thought I won the fight. I hit him to the body and I saw a little fatigue, and he was moving, trying to slick it, you know? He’s slick. I feel I won the fight, but Badou is a 2-time world champion and he’s a great fighter, so I feel I fought a good fighter,” Stevenson said. I agree with Stevenson. He did win the fight from what I saw. He was the better man, and he should have been given the edge. But in a close fight, it’s not surprising the judges scored it a draw. You an even argue that Stevenson should have won all of the first 6 rounds of the fight, because he dominated the action with his power shots. 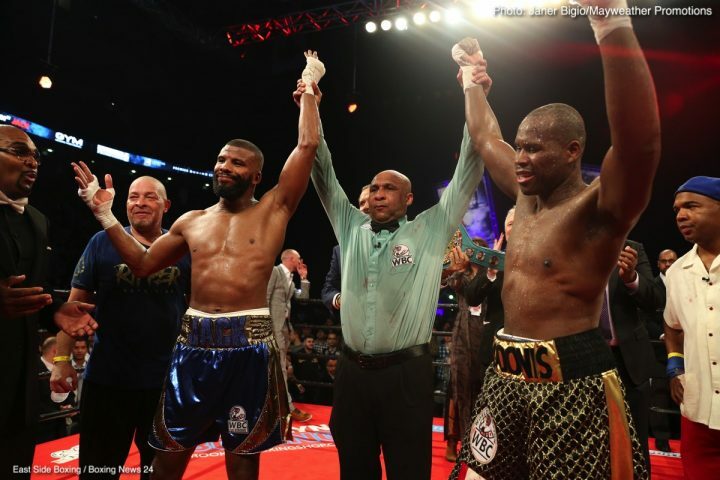 Stevenson fought well enough to win the fight by a 116-112 score by winning 8 of the 12 rounds. Jack looked good in rounds 7, 8, 9 and 12, but he clearly gave away rounds 1 through 6 and 10 and 11. Jack wasn’t getting off with his punches, and this made it easy for Stevenson to dominate with his 2-fisted attack. As good as Jack was in the second half of the fight, he didn’t win all those rounds the way that Stevenson won the first 6. At best, Jack won 4 of the last 6 rounds of the fight. That gave Jack 4 rounds to Stevenson’s 8. The judges should have given Stevenson a 12 round unanimous decision by 116-112 score. Jack did have Stevenson hurt in the 12th, but the judges didn’t score it a 10-8 round. Stevenson was hurt in the final seconds of the round, and it’s unclear how hurt he was, because he was doing a lot of holding at the time. When you hold as much as Stevenson was doing, it makes it hard to know whether he was hurt or simply tired and trying to use up the remaining time by clinching. Stevenson had Jack badly hurt from a body shot in the 10th, and he barely made it out of the round. Jack was still hurt in the 11th, and Stevenson was continuing to land hard body blows that had him holding on and not fighting back adequately. ”If anybody wants to see it [a rematch]…He’s a good fighter,” Stevenson said. ”I kept the pressure on him and I fight. He’s slick, but I used both hands. I touched him a lot with the right hand to the body and I slowed him down. He kept moving. I slowed him down and kept pressing. He tried to come and attack. So, I feel like I won the fight. I can give him a rematch. Of course, I’ll give him a rematch. Oh yeah, definitely. I love it,” Stevenson said. During the interview, Stevenson didn’t come across as bitter the way that some fighters do when the results of the fight don’t go their way. Stevenson was mature and didn’t show any ill will despite failing to get a victory in a fight that should have won. In contrast, Jack seemed bitter and angry about the draw, feeling that it might have been a personal thing with the scoring. It wasn’t a good look for Jack. He should have taken the high road like Stevenson and showed some class. You’ve got to give the 40-year-old Stevenson a ton of credit for telling Showtime Boxing commentator Jim Gray that he’ll give Jack a rematch straightaway. Stevenson could have dug his feet into the sand and said he’s moving on to another opponent for his next fight, but he showed class by letting Gray and the boxing fans know that he want to clear up the 12 round draw by fighting Jack again. That’s what makes Stevenson such a class act. When he lost to Darnell Boone by a 2nd round knockout in 2010, he made it a point to avenge the loss three years later in March 2013. Stevenson stopped Boone in the 6th round. Stevenson didn’t have to fight Boone again, but he wanted to to show his boxing fans that the loss was just a fluke thing. ”I thought I definitely won the fight,” said Jack. “No judge had him (Adonis Stevenson) winning. I have no idea why I can’t get a decision. It could be that they’re jealous of Floyd (Mayweather) and don’t like him. I’m one of his top fighters. I can’t do anything about it. I’m not the judge. I have to respect their decision,” Jack said. Jack is way in believing that he wasn’t given a victory because of judges being jealous of his promoter Floyd Mayweather. That sounds ludicrous. The reason why Jack didn’t win the fight is because he didn’t do anything in the first 6 rounds, and then he lost the 10th and 11th after getting hurt with a body shot from Stevenson. The fight was very easy to score. Jack did Jack in the first 6 rounds, and then rallied in rounds 7, 8 and 9, but then he got hurt in the 10th and gave away that round and the 11th. Jack did finish strong in the 12th, but it wasn’t enough for him to win the fight in my estimation. Stevenson was the better man in the fight in 8 of the 12 rounds and he should have been given the ‘W’ because of that. To make a case that Jack won the fight, you must argue that he won at least one of the first 6 rounds of the contest, which is very hard to do, and then he won all 6 of the rounds in the second half. Jack didn’t do that obviously. Jack was hurt in the 10th and dominated in the 11th. So, Jack deserved to win 4 of the last 6 rounds, and none of the first 6. That makes it 8 rounds to 4 in Stevenson’s favor. He should have won the fight. I know a lot of boxing fans might not like it, but he should have been given the victory, but he wasn’t. It wasn’t a hometown decision by the judges with them giving Stevenson a draw in a fight that he arguably won. If Jack wanted to win the fight, then he should have done a lot more in the first 6 rounds, because he Stevenson win all those rounds. That’s Jack’s mistake. Was it a failure of nerve on Jack’s part for him not to stand his ground and fight Stevenson in rounds 1 through 6? I think it might be. Jack looked terrified of Stevenson in the first 6 rounds, and he showed it by not letting his hands go and running around the ring to avoid mixing it up with the older fighter. Stevenson fought like he was the younger guy last night, not Jack. The roles were reversed. Stevenson fought like he was the challenger and Jack was the champion. If Jack wants to blame anybody for his failure to get the victory last night, then he needs to look at himself in the mirror and accept the blame for not doing enough to get the win. When Jack needed to be brave in the first 6 rounds of the fight, he couldn’t do it.